AirAsia X announces Jeju, South Korea as its latest destination today, setting its course to commence 4 times weekly exclusive direct flights from Kuala Lumpur to the idyllic island on 12 December 2017 with promotional all-in fares from RM199 one-way. The special promo of all-in fares from RM199 one-way on standard seat and RM899 one-way on award winning Premium Flatbed will run from 10 to 15 October 2017 for travel between 12 December 2017 and 25 March 2018, available for booking on airasia.com. 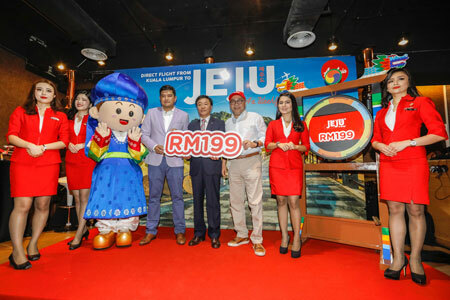 Guests can now make use of AirAsia's Fly-Thru service to connect seamlessly to Jeju from other cities within AirAsia and AirAsia X’s extensive flight network with just one additional stop, or utilise the multi-city option to explore Jeju together with Busan or Seoul before flying back to Kuala Lumpur. Jeju Island, also known as the “Island of the gods”, is a beautiful volcanic island located 64 kilometers south of the Korean Peninsula. It is the country’s most popular holiday island, with more than 70% of visitors being domestic travelers seeking out what has become known as the "Hawaii of South Korea." It is home to UNESCO World Heritage Site Jeju Volcanic Island and Lava Tubes which include Mount Halla, the highest mountain in South Korea and a dormant volcano, Geomunoreum lava tubes and the dramatic landscape of Seongsan Ilchulbong tuff cone. Other attractions including the scenic Jeju Olle Trail, the breathtaking Cheonjiyeon waterfall, Hyeopjae beach and many special themed museums, making Jeju island a destination for all ages all year round. Keep up to date with AirAsia's latest promotions and activities via Twitter (twitter.com/AirAsia) and Facebook (facebook.com/AirAsia).